Lupus miliaris disseminatus faciei (LMDF) is an uncommon, chronic, inflammatory dermatosis characterized by red-to-yellow or yellow-brown papules of the central face, particularly on and around the eyelids. Lesions may occur singly or in crops. Once considered a tuberculid because of the histology, many authors now consider LMDF to be an extreme variant of granulomatous rosacea. Others believe it is a distinct entity because of its characteristic histopathology and occasional involvement of noncentral facial areas. Note the images below. Lupus miliaris disseminatus faciei central facial papules. Courtesy of San Antonio Uniformed Services Health Education Consortium. A variety of treatments are reportedly of some benefit, but controlled studies to establish the best treatment are lacking. Most clinicians find LMDF difficult to control; LMDF may result in disfiguring scarring. Etiology and pathogenesis are unknown. Active disease usually involves a 1- to 3-year course and resolves spontaneously. In 2000, Skowron et al proposed a name change from LMDF to FIGURE (facial idiopathic granulomas with regressive evolution). While the term LMDF is still widely used, the term FIGURE is now appearing in some publications. 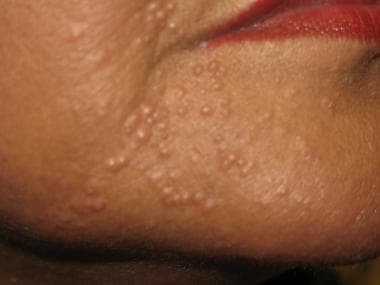 Lupus miliaris disseminatus faciei (LMDF) affects only the skin. Studies have failed to demonstrate Mycobacterium tuberculosis or other mycobacterial disease by culture or polymerase chain reaction. Extrapolating from theories of the pathogenesis of other forms of rosacea, some authors suggest that LMDF is a reaction to Demodex folliculorum. While the usual distribution coincides with that of most rosacea cases, an association with Demodex has not been confirmed. Others suggest that LMDF is a granulomatous reaction to hair follicle destruction or ruptured epidermal cysts. The etiology of lupus miliaris disseminatus faciei (LMDF) is unknown, but suggestions have included infection by M tuberculosis, atypical mycobacteria, tuberculids, foreign body granuloma (particularly to zirconium), reaction to cyst contents, and reaction to D folliculorum. Lupus miliaris disseminatus faciei (LMDF) frequency is unknown; the disease is consider rare but may be more prevalent in Japan. Lupus miliaris disseminatus faciei (LMDF) may be more common in Asians, especially Japanese people. Authors have stated that both sexes can be affected with lupus miliaris disseminatus faciei (LMDF); however, most published reports reviewed for this discussion and cited in the Bibliography describe solely or predominantly male patients. Prognosis for spontaneous resolution within 2 years is good. Therapy may help speed resolution. Recurrences are not described. Educate patients about the nature of the disease to help alleviate anxiety and to establish realistic treatment expectations. van de Scheur MR, van der Waal RI, Starink TM. Lupus miliaris disseminatus faciei: a distinctive rosacea-like syndrome and not a granulomatous form of rosacea. Dermatology. 2003. 206(2):120-3. [Medline]. Skowron F, Causeret AS, Pabion C, Viallard AM, Balme B, Thomas L. F.I.GU.R.E. : facial idiopathic granulomas with regressive evolution. is 'lupus miliaris disseminatus faciei' still an acceptable diagnosis in the third millennium?. Dermatology. 2000. 201(4):287-9. [Medline]. Hodak E, Trattner A, Feuerman H, et al. Lupus miliaris disseminatus faciei--the DNA of Mycobacterium tuberculosis is not detectable in active lesions by polymerase chain reaction. Br J Dermatol. 1997 Oct. 137(4):614-9. [Medline]. Shitara A. Lupus miliaris disseminatus faciei. Int J Dermatol. 1984 Oct. 23(8):542-4. [Medline]. Misago N, Nakafusa J, Narisawa Y. Childhood granulomatous periorificial dermatitis: lupus miliaris disseminatus faciei in children?. J Eur Acad Dermatol Venereol. 2005 Jul. 19(4):470-3. [Medline]. Kalyanpad YN, Dongre AM, Gole PV, Khopkar US. Extrafacial lupus miliaris disseminatus faciei: A rare entity. Indian J Dermatol Venereol Leprol. 2017 Mar 31. [Medline]. el Darouti M, Zaher H. Lupus miliaris disseminatus faciei--pathologic study of early, fully developed, and late lesions. Int J Dermatol. 1993 Jul. 32(7):508-11. [Medline]. Uesugi Y, Aiba S, Usuba M, Tagami H. Oral prednisone in the treatment of acne agminata. Br J Dermatol. 1996 Jun. 134(6):1098-100. [Medline]. Shimizu A, Funasaka Y, Ueno T, Kanzaki A, Saeki H. Case of lupus miliaris disseminatus faciei associated with marked formation of cysts, successfully treated with intralesional injections of triamcinolone acetonide. J Dermatol. 2017 Mar 24. [Medline]. Tokunaga H, Okuyama R, Tagami H, Aiba S. Intramuscular triamcinolone acetonide for lupus miliaris disseminatus faciei. Acta Derm Venereol. 2007. 87(5):451-2. [Medline]. Ferguson L, Fearfield L. Topical dapsone gel is a new treatment option for acne agminata. Clin Exp Dermatol. 2018 Sep 23. [Medline]. 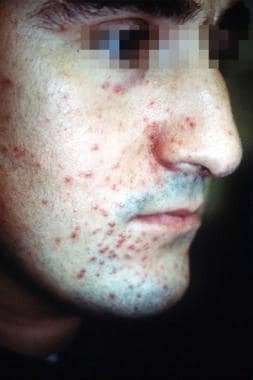 Berbis P, Privat Y. Lupus miliaris disseminatus faciei: efficacy of isotretinoin. J Am Acad Dermatol. 1987 Jun. 16(6):1271-2. [Medline]. Koike Y, Hatamochi A, Koyano S, Namikawa H, Hamasaki Y, Yamazaki S. Lupus miliaris disseminatus faciei successfully treated with tranilast: Report of two cases. J Dermatol. 2011 Jun. 38(6):588-92. [Medline]. Histopathology of lupus miliaris disseminatus faciei showing nodule with caseation necrosis. Image courtesy of Dr. Dirk Elston.